We can all agree that oxygen is precious. It’s the invisible force that fills up each human being’s lungs and gives us all the ability to live. However, many people don’t appreciate the beauty of breathing fresh air. Until you are at your last breath during the moments when you are inflating a balloon, air mattress, or pool inflatables for a party, that’s when it really starts to count. Have you ever tried to blow up 20 balloons, without an electric compressor? Like us, you can probably agree as well that, not only is that exhausting, it’s motivating in finding a better tool that can do the exhaustive work for you. Not to mention, there are definitely items out there that require inflation that using your mouth simply won’t work…and is also quite disgusting. For example, bike tires and basketballs, etc. Right? Well, we know precisely what can make a difference in your life. Check it out! We made updates that will pump you up to make you want to dive even further into this air pumps guide. Happy reading and researching! Do you know what type of equipment we are talking about? It’s an air pump! Anyone who has ever switched from blowing up inflatables with their mouth to using one of these will deem these products one of the best innovations on planet Earth – they are that useful. Whether you need to inflate an air mattress, sports product, balloons, or pool toys for the summer party – having an air pump on hand will be beneficial. This is why we are incredibly excited to share with you our in-depth insights revolving around the best products available today. Each product that you will read about today has been evaluated based on quality, functionality, and the ability to inflate quickly. You see, we know that you don’t want to waste your time with a product that takes 30 minutes to inflate a simple float. Who does? You want a high-quality product that can last for many years, handle any traveling occasion, and save the time otherwise spent self-inflating products with your own breath. So, without further ado, let’s explore the best out there! We offer our top 3 picks right away because we value your time. But please, enjoy the entire guide below where you will find a list compiled of the best 10 air pumps out there, and more criteria information and frequently asked questions, too. Whether you are trying to fill up an airbed, a raft, or any other product that needs inflation, it is a long road ahead, if you expect to complete it by blowing in it alone. It can be a desperate process to try to even fill up an inflatable life vest or beach ball. Can you imagine trying to self-inflate a kitty pool or queen-sized mattress? Well, this problem is made easier with a phenomenal solution, the Intex Quick-Fill AC Electric Pump, a pump that speeds up the process and ensures you begin using your raft before the day is over. Have you ever tried to fill up a bike with a pump and realized you did not have the right nozzle? How about trying to inflate a mattress and you were missing the proper mouthpiece? This pump removes the worry of having to find the best nozzle by providing a connected solution. With three interconnecting nozzles, an individual simply must switch back and forth between each nozzle to use them. Whether it is a life raft, a tube, or even a mattress, the nozzles included can fit universally most products. Buying an electric item as unique as a pump can be frustrating when the electrical plug included does not match an electrical outlet in your home. This then means having to spend more money to purchase a plug that can act as a bridge between both the plug and the electrical outlet. This is no problem with this pump, it allows for maximum voltage while using a common household electrical outlet. When taking a product such as this one into consideration, it is important to evaluate what the product will be used for. For example, an electric pump such as this one offers plenty of power in a simple package, that only is worth it. Cost wise, this is considered the standard price. Standard price electrical pump for beds, tubes, and more. AC Powered electric pump does so in quick-time. The simple and compact design fits in the palm of anyone’s hand. Three nozzle options make it easy to fill any item. Users have mentioned that it is incredibly loud. Users have mentioned that it can be slow. For any sports lover, having the right equipment is extremely important. Let’s take basketball for example. The right shoes, gear, and mental frame of mind is the bridge between winning and losing. However, one thing that is often overlooked is the ball itself. What is the pressure of the ball you are practicing with is different than the one on the court? The Franklin Sports Ball Maintenance Kit is designed to bring solutions and answers to questions such as this one. Let’s talk about what makes this pump a fine piece of machinery. If you are an individual whose life revolves heavily around living on the court, then this is a must-have item to include in any common bag or backpack. The reason being is that you never know when your basketball, football, or soccer ball may need some inflating. Therefore, a product like this comes in handy for sports-lovers who want to ensure they are always prepared. Think of any sports ball like the tires for a car. If the car tires gauge is too low they may not run smoothly. If the gauge is too high, then the tires may pop, evidently resulting in a disastrous situation. The same can happen while out on the court. Therefore, this manufacturer has included a pressure gauge so an individual can ensure their sports ball is at the optimum gauge. This can be the key to ensuring a home win! As the cost per value is concerned, it is important to take into consideration the history of the brand, the value of the item, and the purpose it is intended for. This pressure gauge pump for sports balls helps adjust the air and ensure the sports ball is at the perfect level. Not only that it is made from quality materials and it is easy to carry. 5 Inch Pump length makes it easy to hold in one hand. The extension hose is flexible so you can move it around easily. Includes 3 metal needles in the case of backup emergencies. The plastic carrying case is easy to store and perfect for emergencies. The storage of the needles is in fact in the pump handle, making it compact and easy to use. Users have mentioned that the carrying bag is considered slightly cheap. Users have had problems reading the pressure gauge. There is nothing like knowing you are safely prepared when out on the open road. In any moment’s notice, an emergency can occur and it is always best to be prepared. If you are traveling soon, or overall need an emergency back up in the case of a flat tire, there is nothing like having a portable compressor in the back of your car. Most importantly, one that works well! 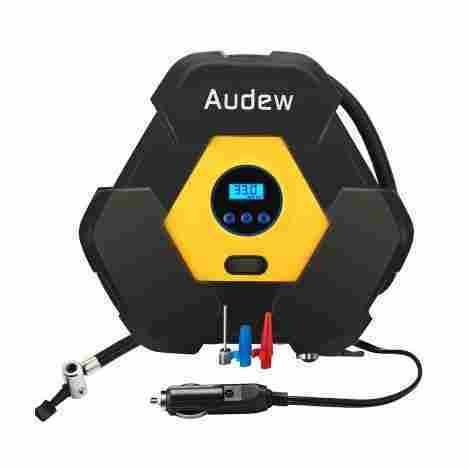 The AUDEW Portable Air Compressor Pump makes it easy for any individual to have added security in the car whether they drive a motorcycle, RV, or regular vehicle. You never know when an emergency is going to happen. Therefore, this manufacturer has designed and specifically created LED lights in the compressor pump for night time use. If you find yourself in the night time needing to fill up your bike or car, this pump makes it easy to accomplish quick repairs and fill-ups. With that said, it also includes a tire inflator system screen, pressure gauge, and bright flashlight for optimum security. A person would think that an item like this would only be powerful if it was bulky. This is far from the truth with this specially created tire pump. This pump was designed with compact ease of use in mind. The reason being, a person can even carry it in their backpack or motorcycle storage compartment. The lightweight design has a 3M retractable power cord that is hidden and it is easy to carry with an attachment handle. When considering cost per value, an individual would assume that a phenomenal solution such as this would be overpriced. However, the opposite is true. This fantastic solution to filling up any vehicle tire comes in a quick, easy to read, easy to use package that can be stored anywhere. Alone, the peace of mind this product intends fulfills every expectation that a person may have of it. For a low price, it offers plenty of value. This product passed multiple safety testing to ensure that it was of the highest quality. With a fast cooling system, it prolongs the longevity of the item. With extremely strong power it can save time and efficiency in just minutes. One key system inflates easily and effortlessly. The Auto-Shutoff feature turns off the system after it has reached the inputted PSI. Pressure gauge determines the pressure while it is inflating. Users have said it does not always lock onto the valve system. Users have mentioned that at times it does not read the pressure fully. There is nothing more upsetting than getting ready for a day at the pool and noticing your favorite lounge chair is deflated. Well, we can think of one more, noticing that your mattress has lost all its juice. Luckily, there are formulated pumps to ease the pain of having to fill these items back up on breath at a time. Let’s talk about the Kwik Tek AIRHEAD AHP Air Pump, a great solution for anyone looking for a universal pump. Sometimes, the hose of an air pump can be hard to use and does not offer the best quality. What makes the hose of this pump much easier is the fact that it is an accordion-style hose that locks onto the pump and fitting valve. This aids in avoiding those pesky connections that make the process so much harder. It is time to ditch the bike pump, mattress pump, and beach toy pump for one universal pump that has three valve fittings. In fact, the valve fittings are the standard universal valves that most inflatable items come with. This saves a person the trouble of having to buy extra pieces or other pumps for a specific item. One pump to rule them all! When talking about cost per value, we would like readers to consider the solution that an item like this offers. Not only is it easy to use, it offers a high-quality build from a trusted company. Also, the power of the motor is strong and the piece itself is easy to use. Therefore, we can say that at a reasonable price, this offers plenty bang for your buck. The easy to carry attached handle means you can take it anywhere. A 10-Foot Power cord makes it easy to inflate any item. The liter-per-minute air filling rate is 300, making it fast and precise. The item itself is durable and can withstand the test of time. Fun to use for all ages. Users have mentioned that it can be somewhat loud. 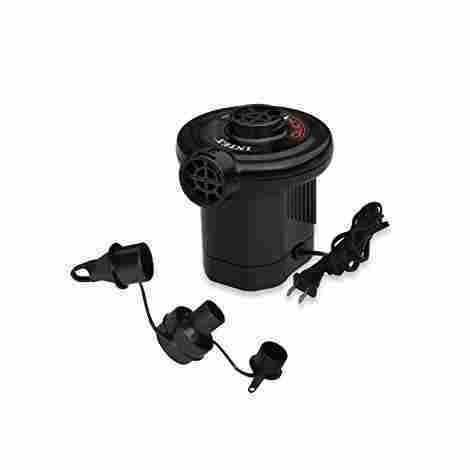 Consumers have mentioned that other models, in particular, the ones used for car tires are much stronger than this air pump. If you are an individual looking for a compact and simple solution to filling up your favorite beach toys, this pump is a great solution. The quality is not only durable and long-lasting, but it comes from a trusted company that has built many quality products. 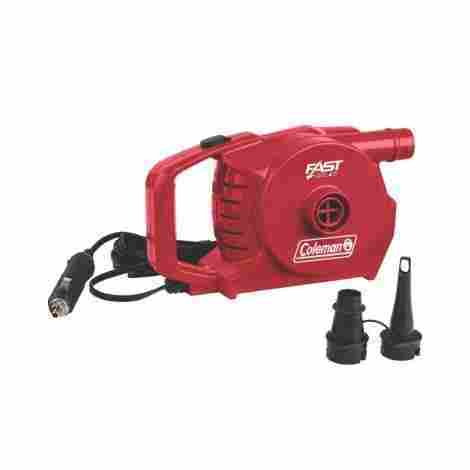 Let’s talk about the Coleman 12-Volt DC QuickPump, a quick solution to pumping specific items. There is nothing more upsetting than purchasing an item that does not include the essential items needed to use it. A perfect example is when certain brands do not include the needed valves for easy use. Well, this manufacturer believes in making the process a lot easier. They have purposely included the adapters for common valve types to make the process a lot easier. As we discussed earlier, sometimes, a product is shipped, and the plug needed is an odd plug that needs an additional piece to operate. 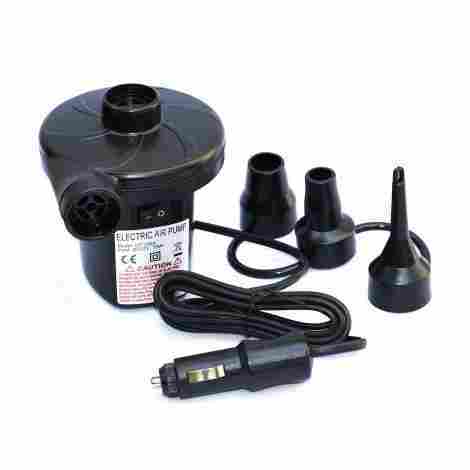 However, this pump is easy to use with the standard plug access and a vehicle cigarette connection system as well. Cost and value are important when evaluating a product such as this one. It is important to take into consideration the product durability, lifespan, and of course, the solution that it serves. For a friendly price, this pump offers strong air flow alongside a high-volume pump that is easy to use, carry, and store. Compact design is lightweight and durable. Two color choices, black and red. Can plug into any standard outlet making it easy to use. Just press on and watch it inflate. Perfect for beach toys or airbeds. Users have mentioned that it takes a while to fully start filling up. Users have mentioned that the pump can be weak when using it with extra-large items. One of the greatest inventions out there may possibly be the pump. It not only saves time but it helps to inflate some of the more difficult items out there. With this in mind, we want to share with you the AGPTEK Electric Air Pump, a faster solution to filling up your inflatable toys, mattress, or swimming ring. 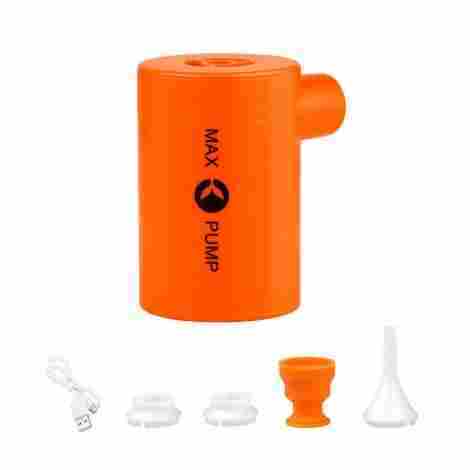 With a focus on power and usability, this pump is the perfect addition to any family that wants to spend a day out on the raft, tube, or having a party full of balloons. Finding a pump that can pump easily and effortlessly can be hard. This is why we are focused on providing the best products and solutions. With that said, there is a unique reason why this pump has made it on our list. It not only inflates at a ridiculously fast speed, it actually can also deflate an item by sucking the air out of it. 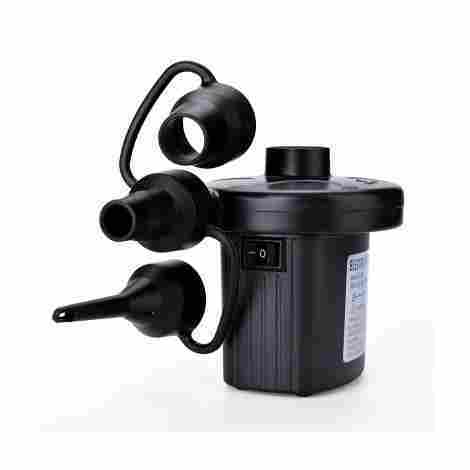 With a car power adapter and home power adapter, this pump can be taken anywhere and used at any time. Another essential quality of a pump is to make sure that it is portable. A portable pump ensures the security that an individual can take it anywhere. This pump is lightweight, is travel-friendly, and has simple storage dimensions that make it a great addition to the car or RV without taking up too much room. In fact, at only 1lbs, the product can be carried by virtually anyone. As one of the pumps on this list, we are eager to share that it is considered one of the best pumps out there for value purposes. The cost itself ranges in the mid-level cost value. However, the precise quality, compact size, and strength make it an undeniable machine that is worth taking on every road trip to the lake. Great tool for home use and simple items. Can be used on mattresses, balloons, beach toys, and more. Can inflate and deflate items. On/Off switch is simple to use. Users have mentioned that this pump begins inflating hot air if used for too long. One of the switches can get stuck at times. Whether you are camping, at the beach, or need any emergency pump, it can quite difficult to inflate any item by mouth alone. This is why portable pumps exist, to make the process much easier. With that, we want to share with you a portable pump that can make inflating any item much easier due to its compact size and air-filling strength. Let’s cover the basics of the X-Lounger Portable Air Pump. The last thing anyone wants to be doing is waiting twenty minutes for a pump to finish pumping into a mattress or beach chair. More than that, no person wants to manually inflate a mattress or a beach chair. Therefore, this pump has mastered the art of filling up an item as big as a mattress in about 2-3 minutes, so they state. The power is thanks to a built-in 26000mAh lithium battery that once fully charged can inflate a mattress up to twenty times. What makes this pump completely unique from all the other ones is that it is completely portable. It is not just easy to carry and lightweight, it, in fact, does not need to be plugged in. Meaning, this pump is fully rechargeable and can be taken anywhere. The pump can be charged via a USB cable or phone charger, making it the perfect companion for camping trips. When evaluating cost per value this one of a kind pump fulfills all the important duties of a regular pump in one simple package. Alone, the fact that it can be taken anywhere and that it does not have a plug is a beneficial use. This pump is lightweight, durable, and easy to store. At only a fraction of the cost per value, it is a great travel buddy in case of emergencies. Can deflate and inflate any item. Powerful, portable and easy to use. Easy to store in any place. Rechargeable battery comes in handy. Attachments are sometimes difficult to use one customer reports. Cannot handle any weight on it or plastic may break. Owning a car bares with it many responsibilities. Ensuring there is always gas in the car, making sure the oil change, brakes, and tires are up to date are only a few of those responsibilities. Most importantly, driving safely and knowing what to do in the case of emergencies is vital for any driver. However, what does a person do when they begin to notice that their tire pressure is really low, and they need to do it at a moment’s notice? 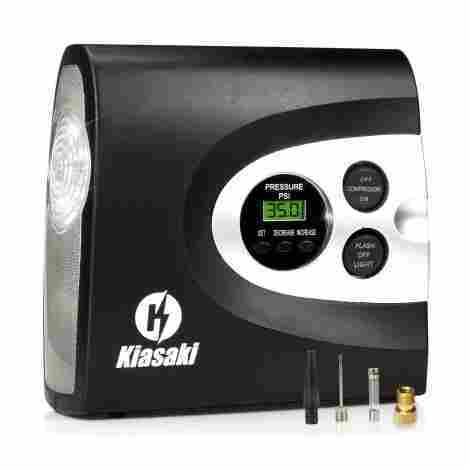 Well, we are eager to share the Kiasaki Compressor Air Pump. It can truly be an extremely troubling process when checking the tire pressure on a car. In truth, having to go back and forth between the pressure gauge and hose is a hassle. So, this pump manufacturer removes the hassle of having to do both by bringing individuals a two-in-one solution. With this pump, a user can both check the tire pressure gauge and fill the tire with at the same time. With a couple simple steps, any person can do it. Simply, check the tire pressure using the gauge then unplug. Following this step is to plug in the compressor and begin filling the tire and then recheck the gauge. Simple as one, two, three! What enhances a device such as this is the durability and the stellar compact design of it. 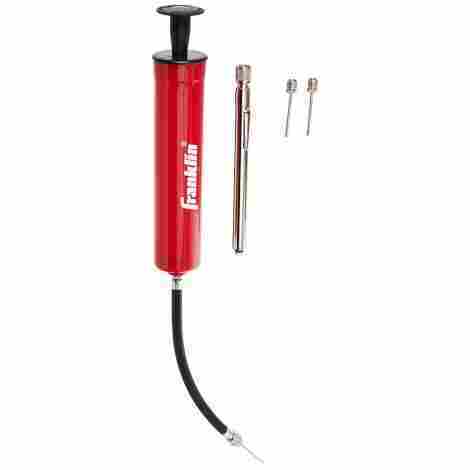 This pump and tire pressure gauge offers plenty of benefits all in a compact and small frame. With a 12ft long power cord hidden in the compartment itself, it is easy to store this in the trunk of the car or the back. It is always important to check what another brands offer. However, when considering the cost per value, it is clear that this manufacturer knows how to solve solutions in an efficient manner. Consumers no longer need to worry about the hassle of checking the pressure and then filling up the with two devices. This more than capable pump removes the hassle of multiple devices, and that is a time saving and valuable device we can appreciate. LED lights help make the process easier in the dark. Red LED light is bright enough to be seen by other drivers. Digital inflator gauge can correct adjust the tire pressure. Simple and easy to use with clear instructions. Long power cord makes it easy to connect and get started. Digital screen aids in making the process easy to understand. Users have mentioned that it can be a loud pump. Only a few reports that it is weak at first. Are you or anyone in your family getting ready for the summer? We know we are! We have our pool ready, our favorite drinks cooling, our beach gear ready, and of course, our inflatable rafts and beach toys. However, there is one key element that is vital to be able to fully enjoy the summer, a pump. With the LotFancy Portable Air Pump, anyone can better prepare for the summer by having one of the best tools handy every time. The purpose of a pump is to help inflate inflatable items in an easy to do manner. Well, this particular pump does so in no time. Much quicker than other old fashion ways, breath by breath! 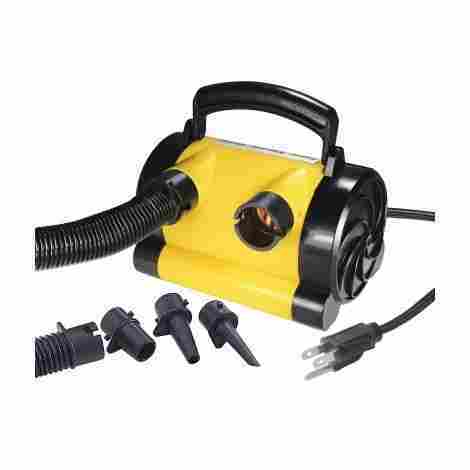 In fact, the electric 12V pump can inflate in just minutes. The easy to use appeal extends to the mechanism. With a simple on/off button, this pump starts inflating from the moment it is plugged in. What is more difficult than finding the right pump for your inflatable items is realizing that the nozzle does not fill every item. That can truly be a pain! In this, an individual must spend even more money buying the right one. Well, not all items have the same nozzle for pumps. However, a pump can have various snap and twist nozzles. This pump includes 3 of the most common nozzles in the industry so an individual can fill up a beach ball, air matters, raft, and more. When determining the cost per value for an item such as this, it is important to look at quality, benefits, features, and of course durability. With the many benefits and features such as three nozzles, easy to understand instructions and more, it is clear that this pump holds its weight in worth. Finding the right pump for your needs is determined by two factors: what you will be using it for and how strong or fast do you want it to be. 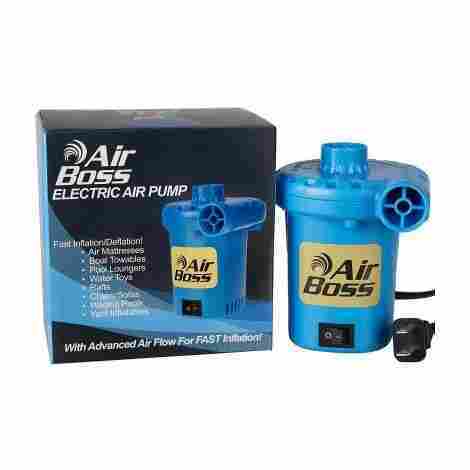 With this in mind, there is a large variety of pumps out there and to top off this list, we want to share the Fine Expectations Air Boss Air pump, a pump designed to make life simple and provide an economical solution to filling up inflatable items. One of the most tiring aspects of an inflatable pump is having to wait a really long time for it to fill up. Nowhere near as slow as inflating the old fashion way, by breath, pumps can still be slow. This is not the case with this particular pump, delivering over 1,000 liters of airflow per minute. With this pump, a mattress can be inflated in less than 4 minutes, making it an extremely easy process. With their “Advanced Air Flow” design, this pump works wonders in filling up mattress, beach equipment, camping gear, and more. It seems pump manufacturers are picking up on the multiple nozzle benefits. Users have regarded having multiple nozzles as extremely beneficial. Therefore, this manufacturer brings three standard nozzles to add to the competitive edge other manufacturers have. With three nozzles, anyone can fill up most standard items in no time. As the last product in the list, this one still is heavily regarded as one of the best available pumps today. Originally released in the UK, this pump supplies users with the need for a fast airflow system that can virtually inflate any item in no time. Inflate a queen mattress and more in just minutes. For these features and benefits, this pump is priced at a low price that can compete with some of the best. No more long inflation times with their new “Advanced Air Flow” design. The blue color is appealing compared to most standard black air pumps. Firm build and well designed. Durable and easy to use mechanism. Three nozzles make it easy to inflate almost anything. Can compete with air pumps double the price. Users have mentioned that it does not inflate as fast as advertised. Users have mentioned that it can get hot after long periods of use. After spending countless hours scanning and researching the entire market of the best products available for consumers today, we can say, with confidence, that this market is completely saturated with options for consumers. With that being said, as a responsible consumer, it’s our responsibility to be able to weed through the best and the worst of products. In truth, in doing so, this is the best way that we can not only get our money’s worth for a product but also to alleviate any stress of having to communicate with customer service departments and getting a refund. We understood, going into this project, how important it was to find only the very best products on the market today. While no one likes blowing up a mattress or pool toy with oxygen – it only gets worse when an individual purchases an electric item, just to find it breaking or unable to handle inflating certain beds or toys. Today, we created this article for interested readers, like yourself. We wanted to provide you with a wealth of information, tips, and tricks to learning what is the best possible product. We carefully evaluated each product based on materials, functionality, and how quickly the product can inflate or deflate. In this, each product that you read about today represents the very best in class for the market. We can say that there are no other products available online, or in stores, that can compete with these products. So, if you are looking for a quality product that can preserve your oxygen and time, the best place to begin your researching journey is here! So, what air pump is going to compliment your air mattress or pool toys? As we have said throughout this article, when you look at the numerous different products that consumers can pick from, it’s evident that this industry is saturated with options. Now, we would like to say, while the conceptual backing of options is effective, when it comes to consumers, it can prove to be counterproductive. Reason being, consumers are essentially inundated with product options, resulting in impulse purchases. With that, we can all agree that impulse purchases are not always the best decisions. So, we wanted to create this article and guide for interested consumers like you. Rather than making a mistake for a purchase or spending the countless hours doing research and evaluation, we are here for you. What you will find in our guide is only the very best information regarding each product, based on an extensive evaluation. Now, prior to our evaluation and research, we thought it was important to create a list of standards and characteristics to use when looking at each choice. This way, each product was fairly critiqued based on the same exact standards. In doing so, we were able to highlight and locate the very best, and the very worst products on the market today. We like to refer to this as our “criteria for evaluation”. If you are interested in learning how each of the products featured in our article was selected, keep on reading! Does the company offer different inflation nozzles? Does the company talk about their inflation or deflation properties? How long does it take for one of these to accomplish its goal? We made it our conclusion that only the best products on the market today can answer all of these questions for consumers. Let’s be honest, no one wants to purchase a product that is complex and difficult to use. Should you really need to read hours of instructions in order to inflate a pool toy? Of course, not! As we began to select products for our list, it was important that each product was designed with simplicity and ease of use. What you will find throughout our guide is products that have been praised for their high-quality designs and effectiveness, but also their simplicity. Now, all manufacturers tend to refer to their products as easy to use. So, in order to cross-reference their marketing claims, we took the extra step to look at what previous customers were saying about their initial experiences with the product. This is a great habit to get into when evaluating products and ensuring the highest-quality good. When it comes to the industry, one of the best ways that a company can set itself aside from the competition is through unique innovations. In truth, they all do the same thing! So, as we began to evaluate different products, we wanted to separate average products from products that were redefining the industry. To do this, we carefully looked at each product and evaluated them purely on innovations. Did the product offer anything new to the industry? How is the product making a difference? Why is this product a favorite among consumers? In answering these questions, we were able to highlight and locate the very best products based on innovations. So, each product on our list today is designed to bring something new, whether it’s increased quality, new technology, or improved innovations in comparison to competitors. In our opinion, one of the most important standards that should always be used when evaluating the best products is something known as the cost-to-value ratio. Now, many consumers tend to avoid using the cost-to-value ratio when picking out a product, which is why some people end up purchasing faulty or poor products. Furthermore, the best way to ensure you are receiving your money’s worth for a purchase is purely through cost and value. So, to figure this out, you need to take the time to look at the price of a product and compare it to what other companies are charging for a similar product. It’s important to take note of products that are relatively priced and those that are priced higher or lower. From there, you can evaluate the value of each product and begin to draw some strong conclusions about how the cost of the product may vary in relation to the value of the product. Now, if you are finding a product priced higher than the competition but lacking in value – avoid that product. When it comes to these, one of the last important characteristics that we evaluated each product on was the idea of its design. In truth, you should never purchase a product solely on design, however, it can be seen and used as a differentiating factor. So, as we looked at each product, we carefully evaluated each product based on the standards listed above. From there, we carefully looked at the images of each product, how the manufacturer described the design and build of the pump itself, and the physical size of the product. In truth, the design is important in the sense that – no one wants to purchase a product that is oddly shaped, large, or difficult to travel with. What you will find in our article today is the very best products, all which come in a unique, compact, and visually appealing design. Q: How do you know if an air pump has enough power to inflate a specific product? A: This is a great question! If you want to know how fast a choice can operate, or if it can inflate a specific sized product, you need to understand the battery power. So, to figure out what the battery power is, look at the product description, which should highlight the power and grade of the power. From there, look at whether the manufacturer includes a list of potential items or sizes of products that the product was designed for. Now, before you make any strong conclusions, be sure to look at what previous customers are saying about the battery power and inflation capabilities. Since these individuals have purchased the product, they are bound to share their positive and negative experiences. Q: How do you know if an air pump can be used for sports products or not? A: When looking in the market, there are a few different types of products. There are products for air beds, products for pool toys, and even specific products for sports products. Typically, sports products require a needle in order to inflate or deflate the product. With that being said, if you are interested in whether a product can handle a sports product, look to see if the manufacturer talks about sports products in describing their product. Also, look to see if the company is offering any needles for this purpose. It may also prove effective to see what previous customers are saying. You might find someone who answered this question in their review! Q: Do air pumps need to be charged prior to use? A: It depends! While this is not the answer that you are looking for, hear us out! There are three main types of pumps: manual, electric, and portable. Manual and electric products will not require any charging prior to use. However, evidently, electrical products will need to be plugged in, in order to work. Now, portable products, on the other hand, may require some charging time prior to use. However, many of the portable products that we shared with you today do not require charging for initial use. Now, if a product does require charging time, have no fears. Typically, this does not take long! You might even be able to connect it to your car, which brings us to our next question! Q: Can air pumps be adapted and used with a car? A: Yes, and no! This entirely depends on the specific product and brand. If you are interested in learning whether a product can be adapted and plugged into a car, you will need to carefully look at the product description. This is a special feature that, if a manufacturer built their product with this adaptability – they would share it. We do suggest looking at previous customers reviews like we have mentioned before. Not only to confirm this but also to evaluate the quality and effectiveness of plugging one of these into a car.